But have no fear! There are Shakespeare’s magnificent plays themselves, thirty-seven gloriously overlong epics which the Reduced Shakespeare Company have helpfully shrunk down to a manageable size. 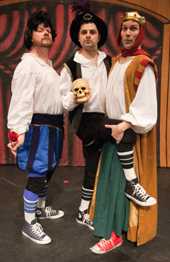 The Bad Boys of Abridgment return to the UK in Spring 2013 to unleash our comic heresy The Complete Works of William Shakespeare (abridged) [revised] on an unsuspecting (and clearly ignorant) British public. Critics have described the show as “Gloriously, relaxingly funny” (Financial Times), “The funniest show you are likely to see in your entire lifetime” (Montreal Gazette) and “a monstrous impertinence” (Shakespeare’s Mum). The RSC (that’s the Reduced Shakespeare Company and not that other RSC that stole our initials) will take you on a roller-coaster ride through all 37 of Shakespeare’s plays in under two hours. You’ll laugh, you’ll cry, you’ll kiss good money goodbye, and you’ll leave the theatre knowing that, without a doubt, William Shakespeare was the greatest British playwright of all time. Only a Brit could survive what we cheeky Americans are doing to him. One final word. There is apparently another survey out there that indicates approximately 9% of the British public believe they actually ARE William Shakespeare. We can’t help you with that. That’s on you.